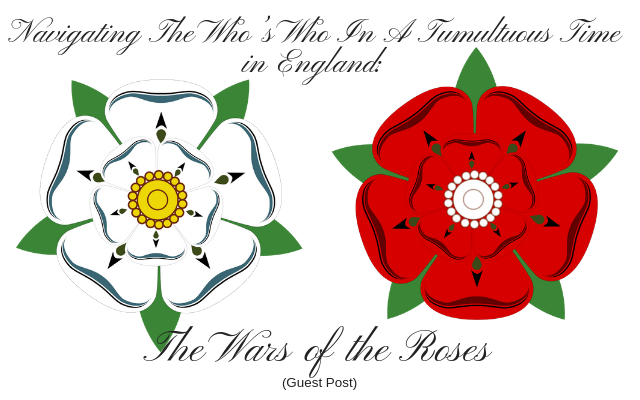 Anyone who has an interest in Tudors history has surely heard of the Wars of the Roses, otherwise known as The Cousins’ Wars. For many, this is a very confusing period in history, as there are multiple players on the board with multiple claims to the throne, all thanks to the multiple sons of King Edward III. It sure doesn’t help that many of them all share the same given names! Due to the extensive detail of this period of history, there was a lot of back and forth and up and down as the Wheel of Fortune turned, before the penultimate checkmate at Bosworth and the union of Henry VII and Elizabeth of York. However, let’s not get ahead of ourselves. First off, who were the Plantagenets? The Plantagenets were a powerful European family originally from Anjou, a duchy in France and a prominent fief to the French crown. The word ‘Plantagenet’ comes from planta genista, which is the Latin name for the Yellow Broom Flower, which was worn as an emblem by the Counts of Anjou. In total, the Plantagenets ruled England for 331 years, which includes the Lancastrian and Yorkist kings, starting with King Henry II in 1154 and ending with King Richard III in 1485. So what does a thirty yearlong war have to do with a king who was already dead for 78 years? Well, it has less to do with King Ned than it does his offspring. It was the descendants of these four men that would spark the Cousins’ Wars. Two brothers fostered the York branches, and two fostered the Lancaster branches. Lionel of Antwerp was the third son of Edward III, but second to survive infancy after his eldest brother, Edward of Woodstock (aka The Black Prince, a nickname he was not given in his lifetime. He predeceased his father in 1376.) Lionel and his first wife, Elizabeth de Burgh, 4th Countess of Ulster had one daughter, Philippa, 5th Countess of Ulster in her own right. It’s through his daughter and her descendants that the female line of York descends. Richard Plantagenet, 3rd Duke of York gets his claim to the throne via his mother Anne Mortimer, who was a granddaughter of Philippa and great-granddaughter of Lionel. Interestingly enough, Richard Duke of York’s claim to the throne also comes through his father’s line as a grandson to Edward III’s fourth surviving son, Edmund of Langley, Duke of York. Richard’s father, The 3rd Earl of Cambridge was the second son of Edmund of Langley and his first wife, Isabella of Castile. Richard inherited the duchy of York from his childless uncle, Edward of Norwich, 2nd Duke of York. Confused yet? Are you keeping all of these Richards and Edwards and Dukes straight? In summation, Richard Plantagenet, 3rd Duke of York had excellent ancestry from both of his parents’ families, which is where the York line get their claim. Through his mother, he was a great-great-great grandson of King Edward III, and through his father he was a great-grandson of Edward III. It was this heritage that his son, the future King Edward IV, would use as his claim to the throne as the first Yorkist king. Moving over to the Lancaster side of things, we will now discuss the descendants of John of Gaunt, as his ancestors also split down two lines. John of Gaunt is probably the most well known son of Edward III. He was the fourth son, but the third to survive infancy. An inordinately large suit of armour housed in the Tower of London is said to have been his, standing at a towering 6’9”, however this claim is disputed and very likely incorrect. It’s through his first and third wives that the claimants of the House of Lancaster descend. John of Gaunt and his first wife, Blanche of Castile were the parents of King Henry IV, who overthrew his cousin King Richard II in September 1399. (Remember earlier when I mentioned Edward of Woodstock predeceased his father? Richard II was his son, and therefore succeeded his grandfather Edward III.) This made them the ancestors of Henry V as well as Henry VI. Whew, that was easy! Aahh, but not so fast. It’s through John’s third marriage to Katherine Swynford that things get a bit more complicated. Katherine was first his mistress for many years, and together they had four illegitimate children, three sons and one daughter. Richard II later legitimized these children as adults, some time after John and Katherine were married, but they were barred from succeeding to the throne by their half-brother, Henry IV. However, when has a parliamentary statute ever stopped someone from pursuing the crown? It was their eldest son, also named John, that the Lancasters derive their second branch from. John Beaufort, 1st Marquess of Somerset and later 1st Earl of Somerset was the eldest of four children of John of Gaunt and Katherine Swynford. He and his siblings took the name of Beaufort, likely from their father’s lordship of Beaufort in Champagne, France. Is Beaufort sounding familiar? It should! It was John’s granddaughter, Margaret Beaufort, Countess of Richmond and Derby who passed her claim to the throne to her son, Henry Tudor. This lineage makes Henry Tudor a great-great grandson of John of Gaunt, and a great-great-great grandson of King Edward III. However, this line was often met with criticism as it was viewed as being illegitimate, despite the fact that the four Beaufort children had been legitimized not only by Richard II and parliament, but also by Pope Boniface IX in 1396. Finally, we come to the fourth son, Thomas of Woodstock, Duke of Gloucester. His descendants get their claim mostly through marriage of the female line, which many felt invalidated their claim entirely. Thomas was attainted as a traitor in 1397 as the leader of the Lords Appellant, who opposed and sought to impeach some of the King’s (Richard II) favourites in order to curb what they felt was bordering on tyrannical rule. On behalf of King Richard II, Thomas de Mowbray, 1st Duke of Norfolk, murdered the undle of the King. It was through Thomas’ daughter Anne and her marriage into the powerful Stafford family that his line gets claim. Anne’s son, Humphrey Stafford was created Duke of Buckingham in 1444, and because of his mother’s ancestry, gave him royal blood as a cousin to King Henry VI. His wife was the Lady Anne Neville (Not that Anne Neville,) who herself was a daughter of Joan Beaufort, which connects back to John of Gaunt as his granddaughter. Humphrey Stafford was succeeded by his son, another Henry, in 1460 as the 2nd Duke of Buckingham. His wife was the Lady Katherine Woodville, sister to Edward IV’s queen Elizabeth. It was this Henry who was implicated in the disappearance and possible murder of the Princes in the Tower in the summer of 1483. He was later executed by King Richard III on 2 November 1483 for his role in Buckingham’s Rebellion. He left a young son, Edward, who was allegedly hidden away during the rebellion in order to protect him from the wrath of King Richard III. After the victory of Henry Tudor at the Battle of Bosworth, the young Edward Stafford was made a Knight of the Order of the Bath as the Duke of Buckingham in October 1485. The attainder against his father (which would have prevented him from inheriting titles,) was reversed a month later. So it would seem that everyone had a blood claim to the throne of England. The real question is, whose claim was the strongest? I thought it was Richard III who was assumed to have imprisoned the princes in the tower and killed them and not one of the Henry’s. Some have suggested The Duke of Buckingham as having procured the murder of the Boys in the Tower, without Richard III’s knowledge or consent. I think Paul Murray Kendal makes the more prominent case to that effect. I love this stuff! What they say about truth being stranger than fiction certainly applies to the royal history of England, including all the Plantagenet and Tudor stories. I’ve read quite a lot on these topics, but when I’ve been away from it for a while, all the Edwards, Henries, etc., start to get mixed up in my head… especially with all those crossed genealogy lines. I never read about these families without a detailed family tree and my reading glasses (because the most detailed family trees require very fine print!) within arm’s reach. Thanks for the recap!